Tokyo never seems to sleep, with its frenetic clubs and midnight bars, neon lights, and salarymen tottering into capsule hotels to wait for morning. But what does the city look like in these pre-dawn hours, outside of the drunken dancing and half-empty cocktail glasses? My friends and I decided to explore the sleepy side of Tokyo, its shifts and sighs after the trains stop running and lights trickle out. Between Odaiba Kaihin-koen Station and Shibaura-futo Station are the two pedestrian walkways of Rainbow Bridge. The northern path looks over the lights of Tokyo Bay, while the southern boasts a view of the Odaiba skyline. On this particular night, there were few cars and no other pedestrians. 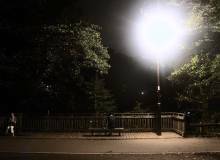 The half-hour walk around the paths was quiet, except for the occasional rattle of a passing train. Blocked off from traffic on one side and bound by cage- like fences on the other, the bridge presents a hike that itself is undeniably industrial. But the views are stunning, particularly that of the long boats that glide around each other like fireflies in the bay. At night the skyline’s reflections on the bay, which aren’t that impressive in the daytime, make literal watercolors. 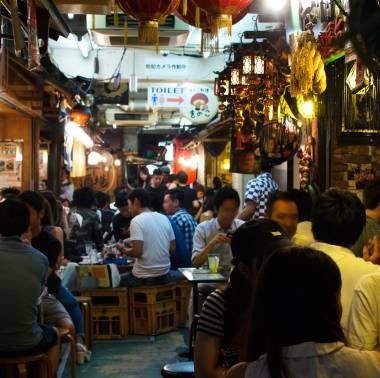 Unlike other popular alleyways like Golden Gai, this yokocho is built indoors. The open-floor plan means the eateries are all jammed right next to each other, patrons of one business mixing in with groups of another. It’s hard to get seats on a weekend night, but if you can, the riotous atmosphere—perpetuated by the guitar-slinging musicians and the occasional grimy plate—feels more like a night market from another country. Fortune-tellers and life-advice dispensers set up their lanterns and spindly tables outside Shinjuku Station. On the east side of the station is an elegant glass-walled terrace that looks out over Takashimaya Times Square. 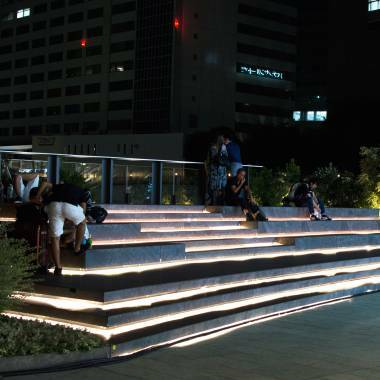 Right by the glitzy NEWoMan mall, this fashionable open-air seating area is a pleasant and quiet interlude from the crowds of the subway, and a good spot for people-watching. Over the next hour, the groups of idlers on the steps gradually dwindle as the last trains pull out from the station until the only ones left are those who, like us, are committed to staying out. The ice tiramisu and French onion soup taste no better at 1am than they do at any other time of day. The abrasive yellow walls hung with faux-Renaissance art have the insane asylum feel of “The Yellow Wallpaper.” A motley crew of characters—the woman in the navy cocktail dress, the man talking into his cellphone about a microwave, the four punks with hairspray enough for a musical—reminds me of Murakami’s novel After Dark, which starts in a late-night Denny’s and unfolds over one night in Tokyo. Meanwhile, as though we’re in a Beckett play, someone keeps ringing the buzzer for the waiter, endlessly. Bzzt. Bzzt bzzt. Bzzt. On our way to Jokakuji Temple, we pass through a pleasant, tree-lined walk for the Bunka Center. One salaryman sleeps sprawled in the street, whom we wake up for fear of passing cars. The gates to the temple are shut. On our way to our next stop, we find Hanazono Shrine, the water purification basin bolted closed and the grounds abandoned. The open space is a welcome relief from the claustrophobic sidewalks. Near the shrine, three more salarymen sleep on the steps. Nichome has more “ikemen” in two blocks than we’ve seen the whole evening … which is how we realize we’re in Nichome. 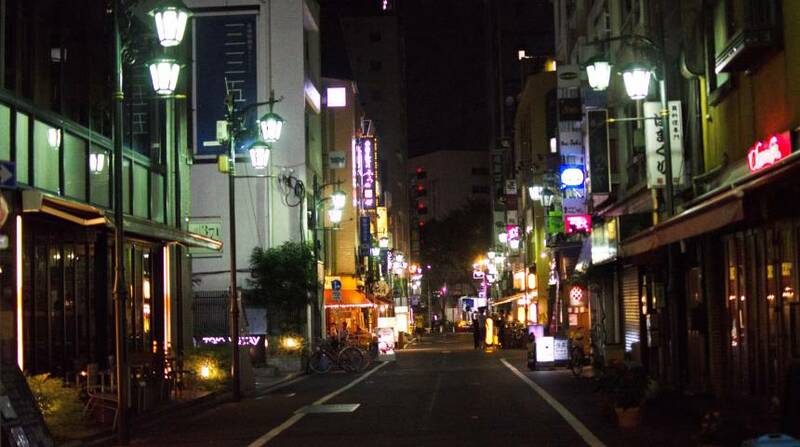 Kabukicho, by contrast, is quieter than you’d think for a weekend night. One girl who looks too young to be out dances to the tinny sound of a cheap boombox, and to a tinier audience. Shinjuku Copabowl is on the fourth floor of a 24-hour building and, at 3am, is the brightest, loud- est, hopping-est place we’ve been to all night. 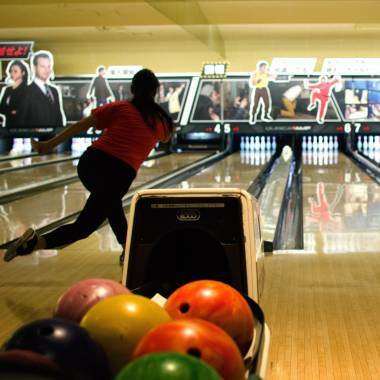 There’s black-light bowling on the third floor, but, afraid we’d fall asleep, we opt for the lit lanes instead. The adrenaline of competition brings us back to life. There’s still the odd izakaya or bar open, one man grilling up shiotan and yakitori from a tiny window. Edinburgh Coffee, by contrast, feels like a Victorian lounge in perpetual late-Sunday afternoon. Businessmen clack on lap- tops, students bend over books. The average drink costs ¥800 and arrives in steampunk-esque glass vessels. The waiters all wear brown vests and slacks, and are too polite to have been up all night. By the time we get back to the station, it’s 15 minutes to 6am. A group in fabulous attire enters the ticket gates in front of us. What their story was, I guess we’ll never know.